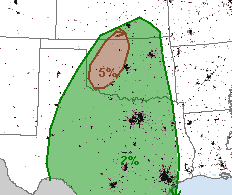 While tornadoes can occur any time of year, it is unusual for a tornado threat to exist in northwest Oklahoma in mid-December. If you live in the brown area, please keep an eye on the weather later today in case warnings are issued.. The thunderstorms will likely be fast-moving.